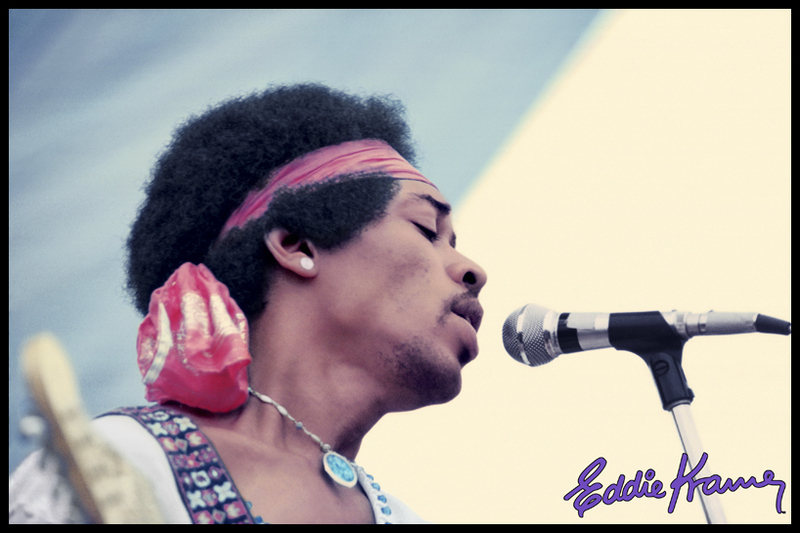 As we remember him: Hendrix and headband closes Woodstock, 1969. Photo by Eddie Kramer (visit http://eddiekramerarchives.com for the story behind this shot and so much more. 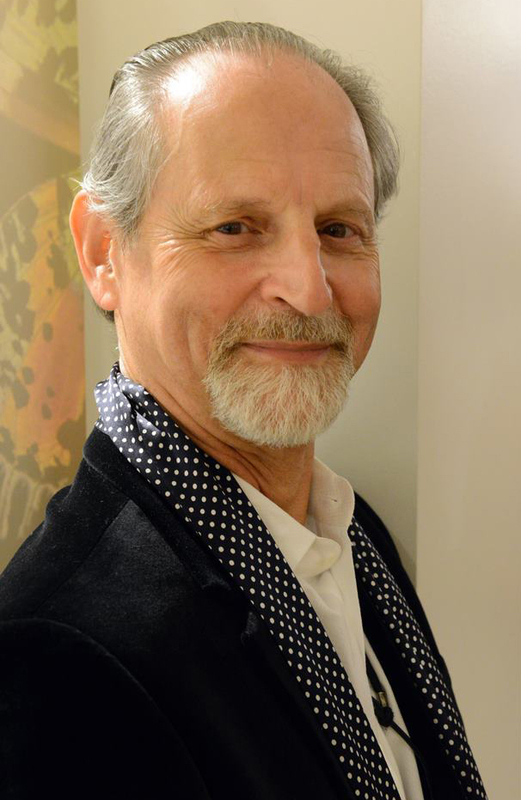 Audio-visual experience: Producer-engineer-photographer Eddie Kramer (in 2013), whose eyes and ears helped bring us Jimi Hendrix. 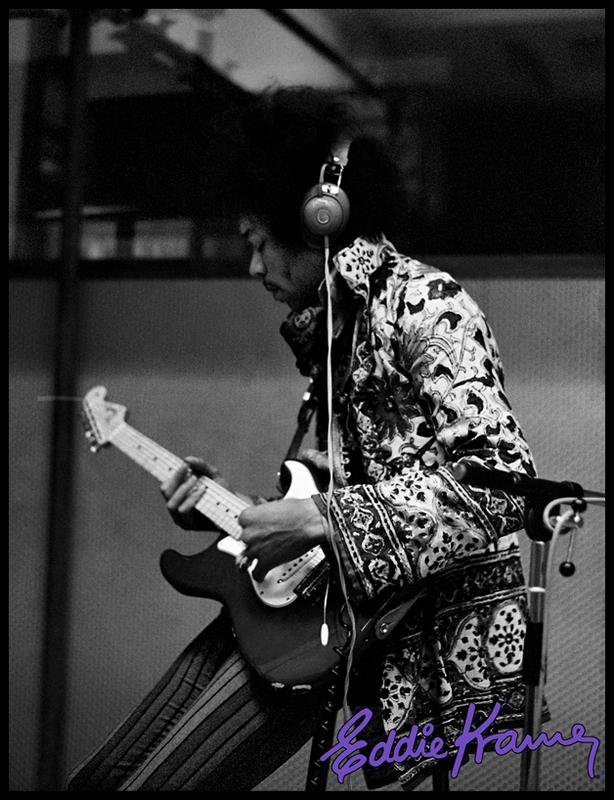 Photo courtesy Eddie Kramer Archives. 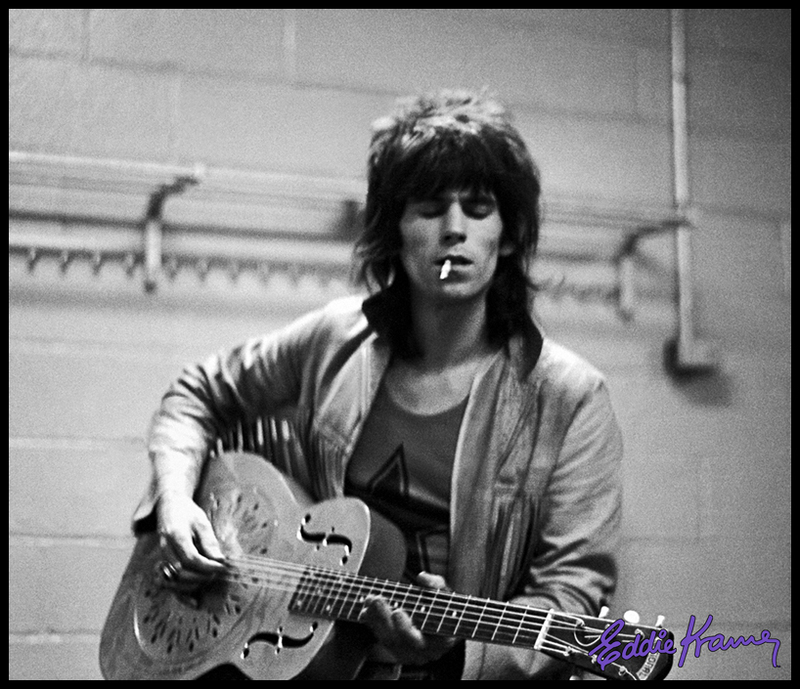 Kramer’s Keith: Eddie trains his camera on Keith Richards of the Rolling Stones backstage at Madison Square Garden, November 1969. Photo kind courtesy Eddie Kramer Archives. To mark the anniversary of the passing last week (September 18, 1970) of Jimi Hendrix, the man widely considered to be the greatest, and certainly most iconic, rock guitarist in history (some people wouldn’t even qualify the title with the “rock” genre tag), here’s the full, director’s (that would be me) cut version of a feature I wrote after interviewing Jimi’s original producer and engineer Eddie Kramer, whose own history and legacy in music is, and will forever be, inextricably linked to the guy who coaxed strange, thrilling new worlds from his Stratocaster guitar. It is not an overstatement to say that Kramer, who oversaw each of the three studio albums Hendrix made during his lifetime, was instrumental in bringing the sounds Hendrix heard in his head to Technicolor life. As terrifically talented Kramer was (and is to this day) behind the boards as the producer and/or engineer on some of rock’s biggest masterpieces (as well as, uh, KISS), the impetus for this story I penned for The Boston Globe back in 2006 focused on another aspect of Kramer’s brilliant tenure in music as right-hand man (or, in southpaw Jimi’s case, left-hand) to the stars: his downtime “hobby” photographing the legends with whom he worked. Amazingly, for years, Eddie’s photos of Led Zeppelin, Traffic, the Small Faces, and the Rolling Stones at work and at play had sat in boxes or on undeveloped rolls of film. But finally, over the past few years, they’ve begun to see the light of day — and rock’s collective historical and visual archive is all the richer for it. Famous producer or no, many of Eddie’s photos are striking and sublime in their own right, often capturing watershed moments in the life of a band or the making of a landmark album. 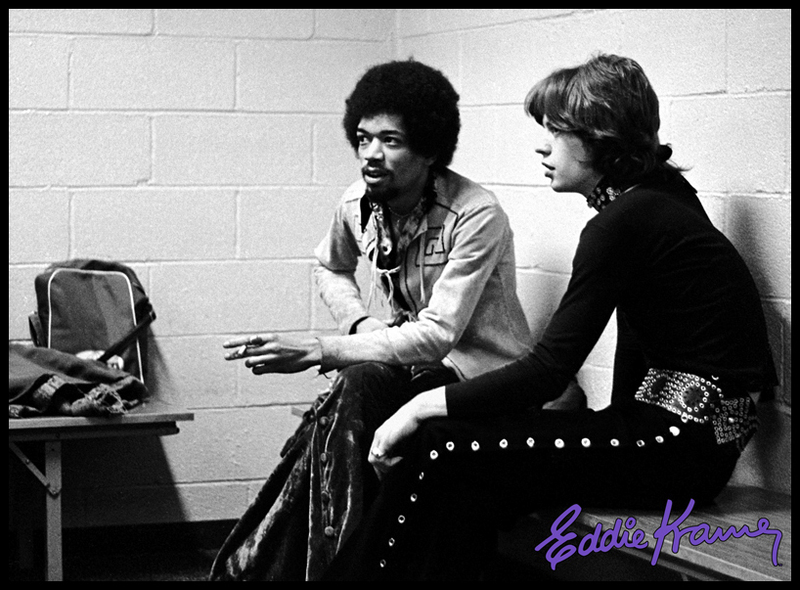 The stories behind the pictures are no less fascinating (as you might expect, a man like Eddie Kramer — whose work in music spans nearly 50 of his 70 years — has a few tales to tell). None of his subjects or stories, however, are as fascinating as his symbiotic, almost spiritual working relationship with Jimi Hendrix. Here’s my exclusive interview with the man who was there from Jimi’s first flight into the purple haze until his tragic crash landing at age 27, with so much accomplished (new worlds created and conquered; guitar god immortality assured), and yet so much left to do. 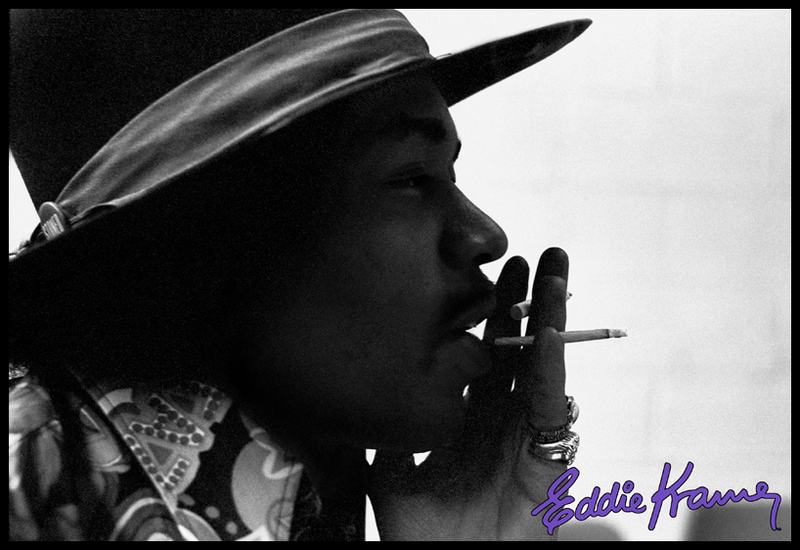 Alas, Jimi Hendrix may be gone, but his music soars still. A special thank you goes out to Eddie Kramer and AJ Newton, Creative Director of the Eddie Kramer Archives, for so helpfully and generously furnishing the fabulous pictures for this post. Eddie Kramer is one of the few people in the world who can tell stories first-hand about the occasions when Jimi Hendrix asked him to make a track “sound purple”. 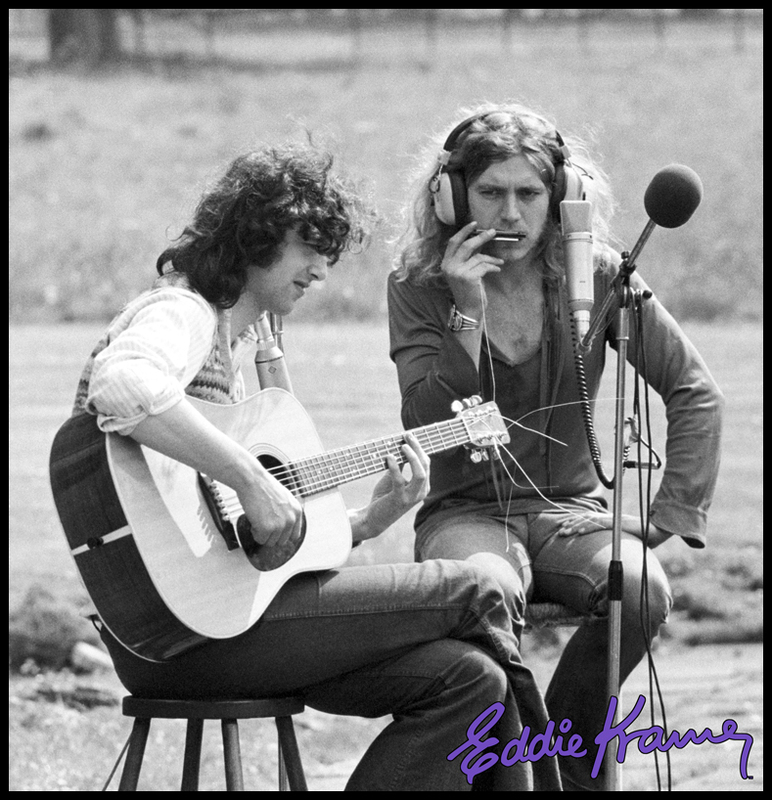 Or the time Led Zeppelin singer Robert Plant, recording his vocals outdoors on the lawn of Mick Jagger’s country estate, directed Kramer to keep the sound of an airplane accidentally recorded during the taping of Jimmy Page’s guitar track (the exchange was preserved for posterity on Zeppelin’s song, “Black Country Woman”). Or the time he played percussion during a couple of recording sessions with the Rolling Stones, and hung out with them backstage at Madison Square Garden. As a producer and engineer spanning more than 40 years, Kramer, 63, has overseen and worked on some of the most influential recordings and significant albums of all-time, among them Hendrix’s ground-breaking “Are You Experienced?” (in fact, all of Hendrix’s studio albums); no less than five Led Zeppelin albums; the Rolling Stones’ “Beggars Banquet”; and works by Santana, Small Faces, Traffic, David Bowie, the Beatles, the list goes on and on and on. That Kramer helped shape the sound and course of rock music at a pivotal moment in its history should come as no surprise to anybody who’s grown up gazing at the gatefold LP credits while “Whole Lotta Love” or “Voodoo Chile” blasted from the stereo speakers. That he also took pictures while he was at it – literally more than a thousand of them – is a more recent revelation. “From The Other Side of the Glass” is a new traveling exhibition that features a selection of Kramer’s remarkable, intimate (and until now, little seen) photographs of three of rock’s best known subjects – Hendrix, Zeppelin, and the Stones – at work and at play. 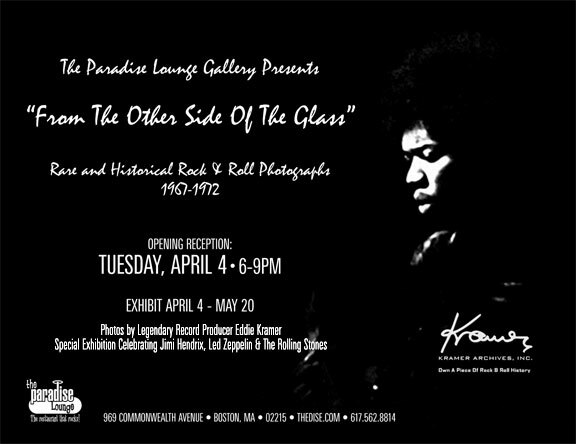 Drawn from roughly 450 images at his Kramer Archives website (http://eddiekramerarchives.com), the exhibit comes to the Paradise Lounge April 4 and will remain through May 20. Also tied in with the exhibit is “Experience Hendrix! A Celebration of the Music Of Jimi Hendrix”, a multi-media event scheduled to take place April 6 at Axis. Kramer will be on hand with Billy Cox, bassist for Hendrix’s post-Experience outfit, Band of Gypsys, for a question & answer session and a special screening of the recently released film, “Jimi Hendrix: Live At Woodstock”, whose newly restored soundtrack Kramer engineered. Flash-forward to 1982 and enter then-Boston University student John McDermott. McDermott would, years later, collaborate with Kramer on “Setting The Record Straight”, a biography of the guitarist, as well as go on to become producer and catalog manager for Experience Hendrix (the family-owned company that during the ‘90’s successfully won the rights to Jimi’s once litigation-riddled catalog). After the fledgling Hendrix historian McDermott interviewed Kramer for a prospective article on the musician, the engineer opened his box of unpublished photographs. McDermott, who still lives in Boston, was amazed and told Kramer that people should really see them someday. (Kramer says he’s since discovered hundreds more photographs and negatives, which he hopes to eventually include in a proposed book of the same name as the exhibit). Indeed, of all the many associations Kramer’s had over the years, none has ever been as fruitful or enduring as his short yet fertile friendship with Hendrix, which lasted from 1967 until the guitarist’s death three years later. Kramer still remembers the first time the young guitarist (whom a colleague had described in advance to Kramer as an “American chappie with rather large hair; you should record him, he’s good”) walked through the door at Olympic Studios. One thing immediately struck Kramer about the young man who would change the course of rock music forever. On the surface, Jimi’s musical genius may have seemed like a terrifically exciting opportunity, and obvious boon, for a young producer and engineer (Kramer was actually one year younger than Hendrix) with a bounty of ideas and imagination of his own. And, of course, it was certainly both of those things. But there were dilemmas, if not exactly “challenges,” that came with the territory of working with an artist who seemed to be operating on an entirely different plane of sound, thought, and musical sensibility than most mere mortals. “With Jimi it was more a question of, ‘How on earth do I take what he is doing, which is so radical and so loud, so unusual — and the dynamics were so wide — how does one capture that on tape’?” Kramer says, sounding awed and even slightly perplexed more than three decades later. “That’s what I had to learn how to do. Fortunately, my background being classical music as a pianist, and also learning how to record classical music, gave me the ability, and a wider palette, to be able to capture Jimi.” And he continues to do so. Under Kramer’s continued, protective supervision of Hendrix’s catalog, and new projects in the works that Kramer and the Hendrix family hopes stay true to their creator’s seemingly limitless vision, Jimi’s legacy remains as towering as it ever was. When you consider that the man released merely three albums (four if you count the double-LP masterwork, “Electric Ladyland”) during his brief 27 years on earth, it can be argued that Jimi Hendrix’s musical impact and influence has been as significant as that of any artist. Incredible pictures, phenomenal writing. No one does it like Kramer and Perry! !